HELP, the baits are mutating! I've seen Manchester Express Road mentioned before (I may have been killed there too). What's also interesting is that although the 21st of April of any year seems to be the deadliest, accidents are happening on other dates as well. As well as Manchester Express Road setting off alarm bells for most Brits, try Googling 'Mekon Associates'. They have obviously been used in a lot of scam formats. Makes you wonder if they are using a format twisted by a helpful baiter. 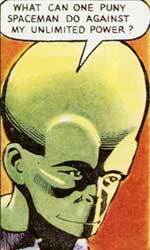 I might have a go baiting as the Mekon, he's an all round nasty dude.